Jean Baptiste Vanmour or Van Mour (9 January 1671 – 22 January 1737) was a Flemish-French painter, remembered for his detailed portrayal of life in the Ottoman Empire during the Tulip Era and the rule of Sultan Ahmed III. Van Mour was a native of Valenciennes, a Flemish town that at the time of his birth belonged to the Spanish Netherlands, but since 1678 to France. He studied art in the studio of Jacques-Albert Gérin, and his work attracted the attention of an aristocrat and statesman of the time, Marquis Charles de Ferriol. Van Mour was invited to go to Constantinople when De Ferriol was appointed there as the French Ambassador in 1699. De Ferriol commissioned van Mour to do one hundred portraits of the local people. In 1711 De Ferriol returned to France and van Mour worked for a variety of other diplomats. In the meantime De Ferriol published a series of one hundred engravings (after the paintings) in Recueil de cent estampes représentant différentes nations du Levant. The book had a great influence in Western Europe and was published in at least five languages. Painting audiences with the Sultan became van Mour's speciality; he only had to change the setting and a few faces. Van Mour worked with assistants to fulfill all his obligations. In 1725 he was granted the extraordinary title of Peintre Ordinaire du Roy en Levant in recognition of both his and the Levant's importance to the French government. 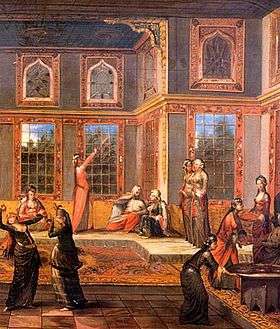 In 1727 the Dutch ambassador Cornelis Calkoen asked Van Mour to record his audience with Sultan Ahmed III on canvas. 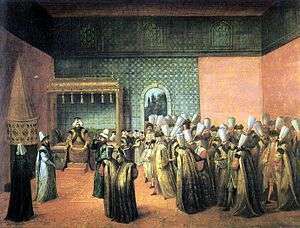 Van Mour was allowed to enter the palace during these ceremonies accompanying the ambassador and his retinue; therefore, he was familiar with the special protocol that prevailed in the Ottoman court for ambassador's receptions. Calkoen took many paintings of Jean Baptiste Vanmour with him, when he was appointed as ambassador in Dresden for the Dutch Republic. In his will of 1762 the bachelor Calkoen forbade his heirs to sell the paintings, which are now part of the Rijksmuseum collection. It is said Van Mour was buried next to Baron de Salagnac in the graveyard of the Jesuit Church of St Louis in the district of Beyoglu.